Makenna Murray, Development Officer: Hi Ross, Hi Kacey, tell me where you just came back from. Kacey Hadick, Staff Researcher/Digital Production Assistant: Καλημέρα/Kalimera (Greek for good morning) We just got back from an amazing project in Greece. 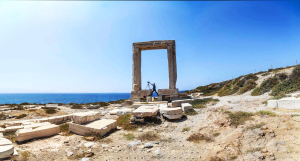 Ross and I digitally documented the Temple of Hepheastus in Athens as well as the Byzantine fortress of Apalirou, the Temple of Apollo and the Church of Agios Mamas on the island of Naxos in the Cyclades. Ross Davison, Field Manager: That’s right. The Temple of Hepheastus is one of the best preserved temples in Greece, which is due in part to its second life as Christian church. The sites on Naxos were pretty varied, a Byzantine church, a Byzantine Castle and the ruins of a Greek temple. MM: How was the trip? KH: I had a really incredible time. This was my first project as a member of the field team and it was awesome to get to be involved in all stages of production. I started researching cultural sites in Greece several months ago but am really grateful that I was able to see them in person and assist in their digital preservation. I also have a much better understanding of what field documentation entails and was happy to try out all the different technologies that CyArk currently uses. MM: What was each of your favorite experience? KH: My favorite site was the Byzantine castle of Apalirou on the island of Naxos. Even though the site was the most logistically challenging to document; it took about an hour of hiking uphill with all of our equipment to get to the castle, the view of the entire island from the top was really incredible. After hiking all that distance up to the fortress, it was easy to see why its location was chosen to defend against invaders. RD: I really loved Agios Mamas because it’s so out there. It’s surrounded by farms and orchards and there has been very little intervention. The Portara at the Temple of Apollo on Naxos was also pretty amazing for the sheer monumentality of the site. You are absolutely dwarfed by it. It was built in the 6th century BC and by the 9th century CE, when they scavenged all the columns and stonework for churches for the newly Christian empire, they had actually lost the technology to lift the monolithic stones out of their historic footings, so the Portara or portal is all that is left standing because they were not able to dismantle it. MM: Wow Kacey, that sounds like a crazy hike. How much equipment do you think you were carrying up with you? KH: We think it was probably 70-80 lbs each with all of our equipment and water for the day. RD: That really doesn’t do justice to what was entailed. No trail, 100 degrees, and about a 45 degree angle of incline. MM: Were there any other challenges that you guys faced? KH: The heat was a big challenge, especially on the days when we had to hike to the sites with all of our equipment and water for the day. It was over a hundred degrees most days so we definitely made an effort to stay hydrated and to remember to apply sunscreen. Naxos is also famous for its high winds and is a windsurfing vacation destination. Although we tried to fly the drone in the morning before the winds really picked up there were a couple days when we were unable to safely fly it at all. RD: At the Byzantine fortress of Apalirou, directly around the structure there is no wind whatsoever, but as soon as you get to the edge of the site where the cliff drops off 400-500 feet down, there are huge gusts of wind whooshing over the top—incredible force. You can imagine what that does to the drone, but even the 40 pound scanner on its tripod was being blown like a kite! So we was did two very bold flights along the cliffs and a lot of shots on the inland side of the island. MM: What technologies were you using and why did you bring them? KH: Ross and I used the Faro X330 Laser scanner to scan the freestanding structures located around the four sites. This scan data will be used to create models that will be accurate to within several millimeters of the original. We also flew our new DJI Phantom 4 Drone which we used to capture aerial photos that can be used for photogrammetry, capture the surrounding site context as well as record the roofs of some of the structures that are harder to reach with terrestrial laser scanning. Using the Artec structured light scanner we were able to digitally document the intricate stonework in the temples and to capture the murals within the Byzantine church. Finally, we completed terrestrial photogrammetry and panoramic photography. RD: We have a huge amount of data and it’s going to yield some beautiful results. I’m really excited to dig into the data especially as we are hoping to produce virtual reality environments. Because the island does see a lot of tourism, visitors really can’t get too close to many of the monuments. It’s a necessary reality, but in virtually reality visitors will be able to appreciate the really fine details that are not normally visible behind the fence. MM: Who did you work with? RD: On site partners are hugely important but first and foremost, we need to thank the generous Greek-American philanthropist who is supporting this work. Without our donors, the CyArk archive would not exist. KH: We worked with the Hellenic Ministry of Culture, specifically the Ephorate of Antiquities of the Cyclades and Athens. Several heritage professionals from the Ephorate of Antiquities of the Cyclades accompanied us in our documentation efforts on the island of Naxos and we are excited to continue our partnership with them and see how the data captured will be used in future preservation work. The American School of Classical Studies at Athens was also an extremely important partner who helped by facilitating access to the Temple of Hephaestus within the Athenian Agora. MM: Tell me more about the sites themselves, how and why were they chosen? KH: The four sites were really diverse. 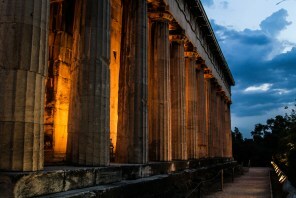 The Temple of Hepheastus in Athens is a large Doric style temple from the 5th Century BCE. Part of the Athenian Agora, the temple is one of the best preserved in all of Greece, however no freely available 3D model is currently available. The three sites on Naxos were chosen in consult with the Ephorate of Antiquities of the Cyclades as they have not been thoroughly documented. Located in central Naxos, the Church of Agios Mamas was the principal cathedral of Naxos during the Byzantine period. The structure is in a state of disrepair and is currently threatened by water infiltration and solar damage to the sensitive frescoes. 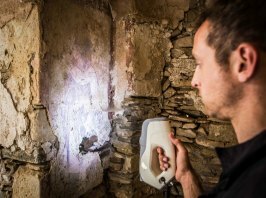 Site conservators will benefit from a complete inventory of the church so that they can monitor deterioration and plan future preservation initiatives. The Byzantine castle of Apalirou is located high on a mountain in Central Naxos and was used as the administrative capital for the Aegean for several hundred years until falling to the Venetians in 1200 CE. Despite its important historical role, a complete inventory of the existing structures has not been completed. The data we captured from the site will provide an accurate base map showing the remaining freestanding structures at the site. Finally the Portara or (Great Door) is a massive marble doorway, and last standing vestige of a large Ionic order temple which was constructed in 530 BCE. Situated at the entrance to the main port and largest city, the virtual reality environment from this site will allow people to interact with the templ in ways not normally available to visitors. MM: Thanks for talking with me, guys! I look forward to seeing the final products.